BANZAI PIPELINE, Oahu/Hawaii (Friday, December 19, 2014) – In one of the most dramatic days in the history of the Association of Surfing Professionals (ASP), 20-year-old Gabriel Medina brought joy to millions of his Brazilian compatriots by claiming his and the country’s first ASP men’s world surfing title in Hawaii yesterday (Friday). Medina was in superb form throughout the five heats he contested in the powerful 2.5 metre waves, progressing from Round 3 to the Final of the Billabong Pipe Masters in memory of Andy Irons, where he posted the only perfect 10 point ride of the event. Medina was pipped for the Pipe Masters event title by Julian Wilson (AUS) who marked his first event victory on the 2014 Samsung Galaxy ASP World Championship Tour (WCT) and the second CT win of his career after a six-heat marathon session on the final day. It all came down to pure, deep, committed tube riding in the closest Pipe Final on record as Medina and Wilson opened their accounts by going different directions on the same wave for tube rides and ended it with a brilliant exchange. Final score-lines showed 19.63 (9.93 and 9.70) for Wilson, to Medina’s 19.20 (10, 9.20). “It was an incredible day and I’m honestly speechless,” said Wilson. “Words can’t describe. I don’t even know how to feel yet. 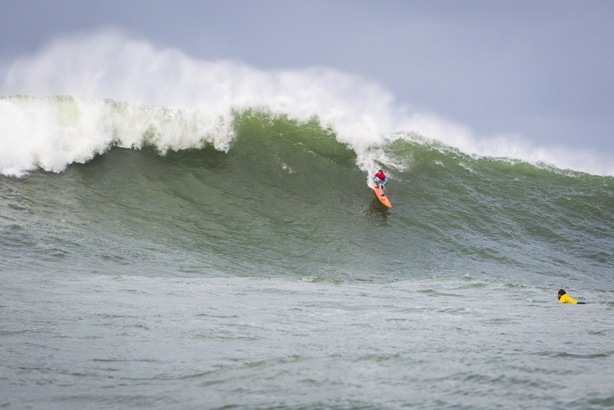 To win the Pipe Masters in good waves and having been out in the water for three heats in a row is amazing. I just found a groove and me and Gabriel got to duel it out — that’s what it’s all about. Wilson was further rewarded for his tenacity when his last minute victory in the Pipe Masters saw the Australian clinch the Vans Triple Crown of Surfing, the second most prestigious award in surfing after the ASP World Title, overtaking rankings leader Dusty Payne (HAW), who had been ousted by Medina in Round 3. Wilson pocketed $100,000 for the event win and a bonus $50,000 for the Triple Crown series. Brazilian Alejo Muniz played a pivotal role in Medina’s World Title success, eliminating both rival contenders Mick Fanning (AUS) and Kelly Slater (USA) from the competition. Muniz was eventually defeated in the Quarterfinals by Adrian Buchan (AUS), who took equal third place alongside compatriot Josh Kerr. Fanning’s Round 5 loss ended his hopes of claiming a fourth World Title and saw him leave with a 9th place finish and end the year in second place on the WCT rankings. For more information, log onto aspworldtour.com.